Westfair Water is well known for diagnosing residential and commercial water issues and providing top-notch water system repair services. Customers, and non-customers alike, call us daily with urgent water system questions and need answers and solutions quickly. Our knowledgeable inside staff coupled with expert field technicians provide homeowners and commercial property owners with quick and reliable water system repair service they expect. Click on the water equipment below for more information. Did you just move into a home with a water softener? Or, have an old softener that is not providing you the quality of water you think it should be? Using too much salt? Or, none at all? Most likely your system needs repair or just a service call. Water Softeners help remove unwanted minerals like iron and manganese from your water supply and they are a great addition to any home as long as they are working properly. Like most mechanical devices Water Softeners have a lot of moving parts: pistons, drain seals and injection points that get clogged, stuck and brittle over time. If you own one of these systems don’t wait until its tool late to get it repaired. Contact Westfair Water for a free in-home consultation. The first question to answer is, “Where is the filter located?” Under your sink, Point-Of-Use (POU) or down in your basement, Point-Of-Entry (POE)? There are many different types of water filtration systems for both POU and POE, too many to list, but they all have 3 similar characteristics. First off, the filters need to be changed. 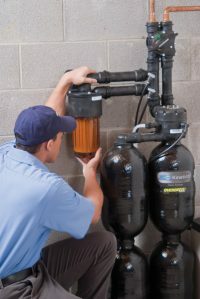 The most common mistake homeowners and business owners make is letting a filter go through too many gallons of usage before changing and performance suffers. Second, you need to use the right filter. So often the wrong choice in filtration leads to undesirable water quality that can be easily corrected with the right filter. We firmly believe that testing your water before and after the current filter will help us make the correct recommendation based on what we find. Lastly, all cartridge style filtration systems needs some sort of sanitizing. They can be a breeding ground for bacteria and sanitization is a commonly over looked procedure that can keep your water quality pure. Whether you have a small system under your sink or a large one for you entire home, Westfair Water can help. Do you have blue-green staining around your home? A large off-white apparatus in your basement that looks like a scuba diving tank and gushes out water around 2 a.m.? Then you might just need a service call to solve your problem. A media called Calcite needs to get added to these large fiberglass tanks to continually do its job properly. Calcite is a naturally occurring calcium carbonate media which can be used to neutralize acidic or low pH waters to neutral, less corrosive levels. Not all Calcite is of the same quality, and adding it can be a tough proposition if you haven’t been trained how to do it properly. Calcite is a crushed and screened white marble media. One of the advantages of Calcite is its self-limiting property. When properly applied, it corrects pH only enough to reach a non-corrosive equilibrium. It does not overcorrect under normal conditions. Upon contact with Calcite, acidic waters slowly dissolve the calcium carbonate to raise the pH from acidic to alkaline, which in turn reduces the potential leaching of copper, lead and other metals found in typical plumbing systems. The Calcite Neutralizer will periodically backwash to prevent packing, level the media bed and maintain high service rates. Depending on pH, water chemistry and service flow, the Calcite bed will have to be replenished as the Calcite is depleted. This is not a do-it-yourself recommended service, let the qualified technicians at Westfair Water perform this task for you and rest easy, your water quality is in good hands. Is there an odd purple glow coming from one of the corners of your basement? You might be the owner of a bacteria-killing machine and you don’t even know it. Ultra-Violet (UV) Lights do a great job removing coliform bacteria by eliminating the live cells. Although, there are two maintenance issues that require yearly attention. First is that the UV Bulb needs to be changed, they lose their intensity over the course of a calendar year and replacement is the only remedy. Second is that the quartz sleeve (which the UV Bulb sits in) gets coated with minerals and needs to be cleaned otherwise the UV Light intensity is dulled by a cloudy glass casing and cannot do its job properly. Do you hear something repeatedly making a noise in your basement when you use the water? You might have a chemical injection pump of some sort that was installed to solve a problem at one point. They have many different uses and could be used for a number of different applications: removal of rotten egg odor, raising pH levels, sequestering iron, anti-corrosion and even killing bacteria. These systems work great when using right mixture ratio and properly maintained for a clean injection. Invite us into your home for a free consultation and we’ll help you figure out why you have it, what needs to go inside and how to keep it pumping clean, clear water through your home. For more info about our water system repair service call us or fill out the form below.